This is the old station at Belasis Lane which was for the use of ICI employees. It was situated behind the ICI engineering school. In the background you can see Charltons pond, the trees around the pond are now 30 or 40 feet high. Photograph and details courtesy of Gordon Armes. I don’t recall there ever being a football field adjacent to Charltons Pond. This was part of the diversions that took place when they put the new bridge in near Fussick bridge at Norton I believe in 1965. I do have the date of this photo I will look it up. 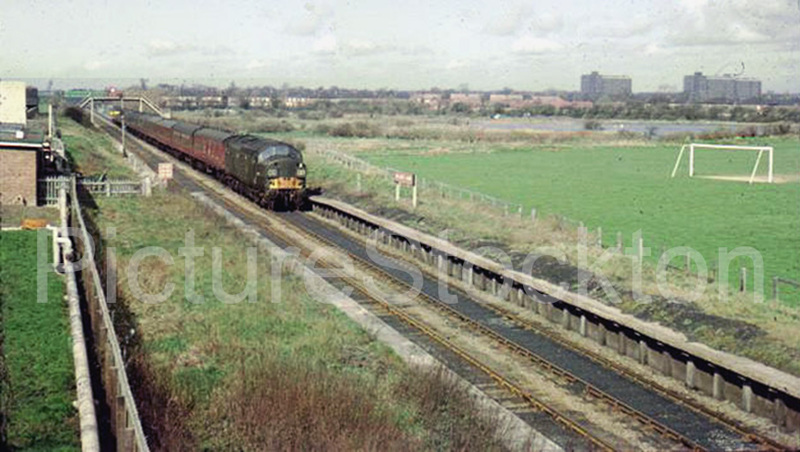 The driver would have pulled his train past the branch points at Haverton Station a relieving engine that was in the sidings there went on top then pulled the train forward to Haverton South then through the Billingham Beck Branch exiting at North Shore then forward on its journey. Gordon, Would that have been a diverted train or a rail tour ?